Do you want to compress your images before uploading them online? Sometimes you may have a large number of photos to be used on your website, so you need to optimize images to help your site load faster. In this guide, we will share the 15 best free image optimization tools for image compression. Software like Adobe Photoshop can be expensive and out of budget for many website owners. However, there are a variety of online tools that are free to use and deliver amazing results. Why should you optimize images? Uploading full size images may add considerable load time to your web page and it annoys your users. Optimizing your images will greatly help to speed up your website. 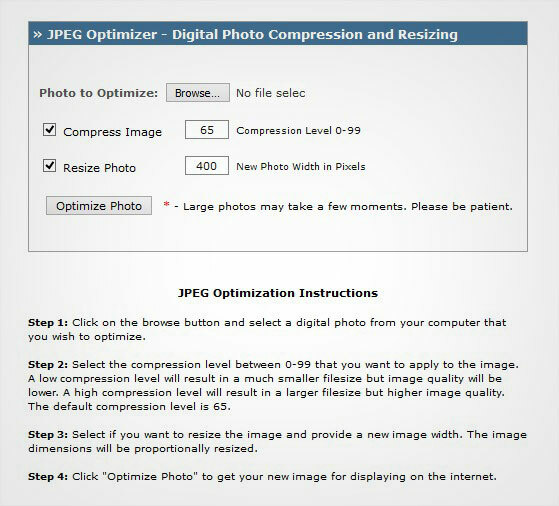 JPEG Optimizer is a simple image optimization tool that allows you to upload and compress the photos online. As its name implies it does JPEG and only JPEGs. The image compression level bar makes it easier for you to optimize your photos as you need. You can also resize the images in JPEG Optimizer, so the image file size can be reduced and it loads faster on your site. It also has an EXIF reader. Optimizilla manages to reproduce great quality in your images with lowest file size possible. You can compress your JPEG and PNG photos with this tool. Theres also a cool slider which shows you the before and after version so you can preview the quality of your image before continuing. This is great because you can figure out how low you want to go before there is any noticeable loss in quality. It allows you to upload up to 20 images and set the compression level for each photo separately. The downside is it won’t let you do PDF like some of the others on this list. This may not matter to everyone. Kraken is an amazing image compression tool that allows you to bulk upload photos (JPGs, PNGs and animated GIFs) and optimize them for the lowest file sizes. You can download the compressed photos one by one or in a zip format to save time. Kraken also allows you to export files to Dropbox or import files from Box, Dropbox or Google drive. It has a pro version for advanced users that come with a lot of other features like image resizing, multiple image sources, unlimited image sizes and more. The free version allows you to compress photo files up to 32 MB each in size and up to a total 100MB of photos. They also have paid plans based on images per month – $5/mo for 500MB, $9/mo for 2GB, $19 for 5GB and more. ImageRecycle compresses your JPEG, PNG, GIF and PDF images and the results are impressive. It has the option to drag and drop the photos into their site to get them optimized. They also have an API for developers to utilize ImageRecycle’s compression capabilities. It also allows you to analyze your website and get a report that will help you understand which images need optimization to increase the performance on your site. ImageRecycle has WordPress plugin, Shopify app, Joomla Extension, and a Magento extension, so you don’t have to go to their website every time to compress your images. They also have paid plans – $10 for 1GB, $20 for 3GB and $50 for 10GB. 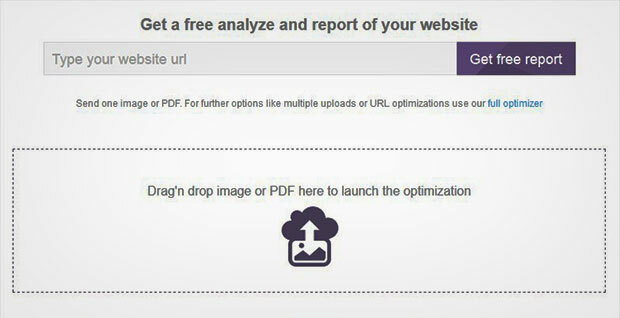 CompressNow is another easy to use optimization tool that allows bulk upload. You can simply upload your JPEG, PNG and GIF images from the computer, set a compression percentage for the image and download it to use on your site. You can drag and drop up to 10 images at a time, select a compression level at the top of the page and viola! Trimage works well for Linux users and removes the EXIF and metadata from the images and compress them to the highest levels possible. It allows you to optimize the JPEG and PNG image file types only. If your a Mac or PC user the other options on this list will be your better bet. Online Image Optimizer is a product of Dynamic Drive that allows you to easily optimize images of all major formats, so your photos load faster on your website. You can also convert the images from one image type to another using this tool online. It only allows one image at a time to be uploaded and has a maximum file size of 2.86 MB. Tiny PNG is one of the oldest and most popular free image optimization tools with tons of possibilities to compress images for your site. This tool accepts JPEG and PNG images for compression. It allows you to upload up to 20 images in one go and up to 100 images a month. The image size for each image should not be more than 5 MB. After the compression, you can download the images to your computer or save them in Dropbox. They also have a WordPress plugin and a Magento extension to avoid having to go to their website to compress your images. Resize Photos is yet another free image compression tool for image optimization. You can also resize the photos to use them on your site, email or forums. Simply upload the images online and set the compression level between 1-100 to optimize images as you need. They also have a feature to apply image effects from their website including captions, photo effects, borders, reflections, shadows, and rounded corners. GiftOfSpeed has tools to compress your PNG and JPEG images separately. It applies multiple image compression techniques to minimize the file sizes to lowest size possible. It allows you to resize the images for a greater performance online. The downside on this one is you can upload multiple files for PNG, but not for JPG types. 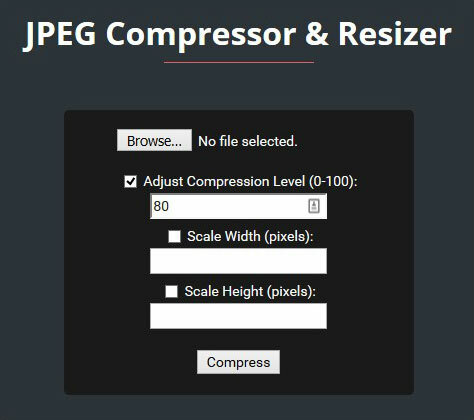 Compressor.io makes sure that you don’t loose the image quality and also get the high compression levels to reduce file size to maximum possibility. It is an amazing tool and known for its flexibility to optimize JPEG, PNG, Gif and SVG files easily. 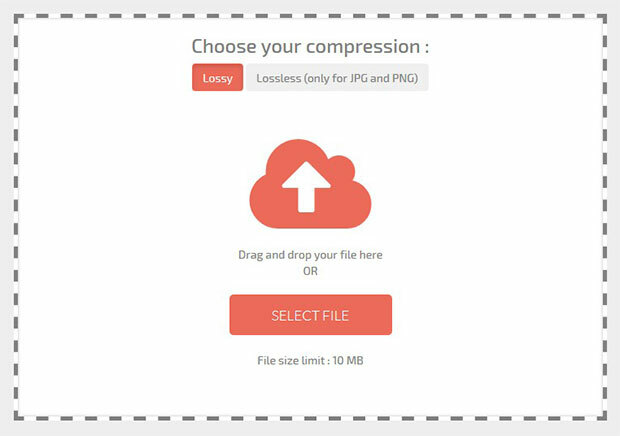 Compressor.io has the ability to reduce file sizes up to 90% or even more. The only downside is the inability to upload multiple files at once, you’ve got to do them one by one. 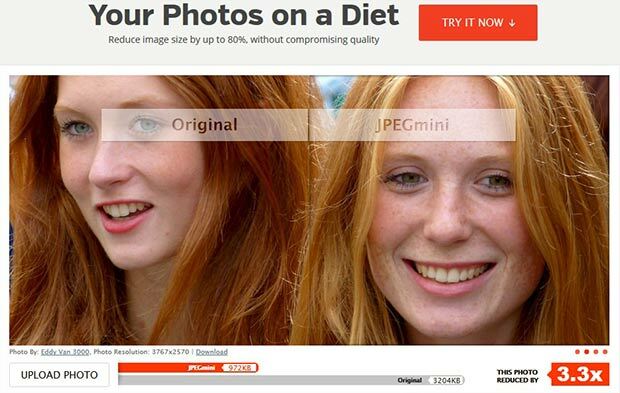 JPEGmini sends your images on a diet. It shrinks the file size of your images, so you can enjoy the best image loading speed online. It has a better interface than some of the other options with an option to upgrade to their Pro version. Upload your image and see the before and after effect with the slider. JPEGmini maintains the quality of the image after compression. 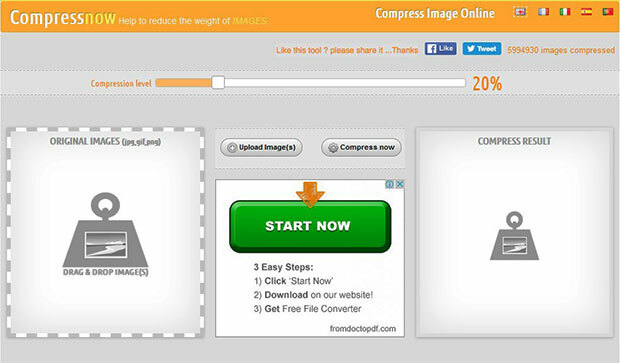 Compress.Photos allow you to easily optimize JPEG and PNG images without losing the quality. It works great on photos to compress the file size and makes it smaller. You can upload bulk photos at once and optimize them online with Compress.Photos without much loss in quality. 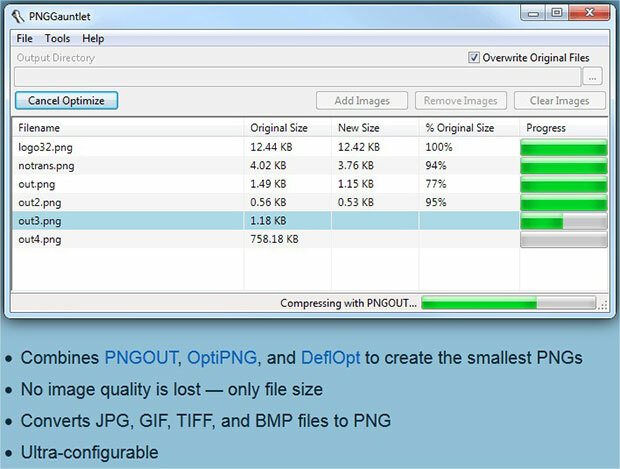 Convert Image is an online image optimization tool to compress your JPEG images on the go. 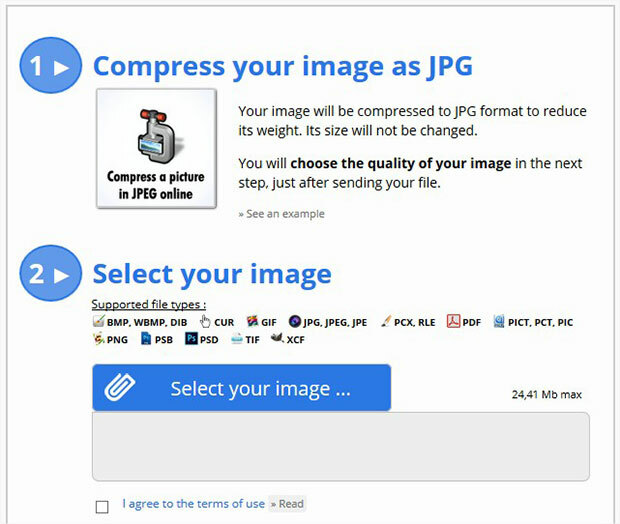 It allows you to convert the JPEG photos into other image formats like BMP, GIF, ICO, PNG and more. It even has some onboard settings which can reverse image, crop, straighten out an image and more. PNGGauntlet allows you to optimize your PNG photos. It is downloadable and combines with multiple compressors like PNGOUT, OptiPNG and DeflOpt to compress your images without effecting the image quality. It will also work convert and compress JPG, GIF, TIFF, and BMP to PNG files. On the downside it does take a little longer then the other options. We hope this guide has helped you to find the best free image optimization tools for image compression. If you like this guide sign up for our newsletter and please follow us on Facebook and Twitter for more free photography tips and resources. For me what works best on mac is a combination of Jpegmini and optimimage. I usually do it 2-3 times each for the same photo until I get what I want. Hello friends , I find a new online tools to compress my image size and i got speedup my page loading , i mean you should try it to reduce your image and speedup your webpage loading. I am using image compresion api’s for a while now . Tiny png and cloudinary are the best out there . I dont understand how cludinary did,nt make it to the list. No other vendor can resize and compress image faster and better then cloudinary . Cloudinary is a premium service by the way . But it deserves a look. For me, because my photos has solid colors on footer of all, http://www.giftofspeed is the best and has fewer compression artifacts. Nothing beats it. These all apps are best image optimization tools for image compression. You just drop your images into the window and have it losslessly compressed on the fly! It’s open source and uses proven technology (JpegOptim and OptiPng). Awesome app! I would have loved some offline utilities/apps. Online ones come with a lot of limitations for free users and recurring monthly/yearly fees, whereas most applications are a one-time buy and you don’t need to be online the whole time to work with them. Great article and great selection of apps! Made my work day a whole lot easier today! I use JPEG optimizer tool, which compress the image better.. when i have png image with transparent background then use the tinypng site. Do these image optimizing tools strip out IPTC data? This blog is very helpful for the SEO Beginner.